Fly-fishing in Colorado should be on every fly fisherman’s bucket list. Better yet, do it now. Streams near Aspen and Breckenridge provide some great trout fishing. The state is loaded with an abundant supply of fish and beauty. There are plenty of opportunities to walk and wade and places to use a drift boat. With the beautiful rivers in places like Aspen and Breckenridge it is no surprise that this paradise has not been kept a secret. Many of the rivers have trophy fish around every corner. When you are not looking at a beautiful fish on the end of your line you can marvel at the beauty that surrounds you. One more thing that makes fly fishing here so amazing is how close many of these world-class streams are to each other. Many of them even feed into one another. If you spent a week in the state you could easily visit one great river after another without driving very far to do it. There are plenty of fly-fishing guides available for these great mountain streams. The Frying Pan River is one of the best fly-fishing rivers in America. The Frying Pan River starts just east of Aspen and flows towards the Ruedi Reservoir. When it leaves the reservoir it flows 14 miles where it finally meets up with Roaring Fork River at Basalt. It is this stretch of river that makes the Frying Pan a fly fisherman’ favorite. The Blue River flows north through Breckenridge and Silverthorne. The Upper Blue River, also known as the Stair Steps is just north of town and holds many fish in ponds created by these steps. There is very easy access along the bike path that follows the river. The Arkansas River starts in the scenic towering Mountains and has a wonderful view of two of the tallest Mountains in the state, both topping 14,000’. Not only is this river known for its great fly-fishing, it is also one of the best rafting rivers in America. Though this river is about 300 miles long the most popular stretch of the Arkansas River is between Leadville and the Royal Gorge. The Roaring Fork River is a free flowing river that is 70 miles long from the headwaters at Independence Pass to Glenwood Springs. The Roaring Fork River passes right through the beautiful town of Aspen. About 3 miles north of Aspen is where the private property starts so an angler must be aware enough not to trespass to gain access to the river. Well you cannot fly fish in the state without fly-fishing the mighty Colorado River. 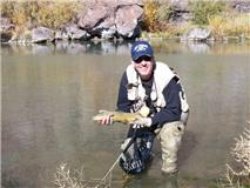 The popular fly-fishing stretch is between Hot Sulphur Springs and west to Glenwood Springs. 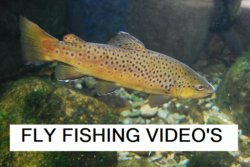 Do you have any comments about any of these great rivers listed, or other great places to fish in your state? If so, please share your comments. Have you had an adventure lately? Visit http://www.adven tures-in-colorado.com for information on Colorado fishing, camping, boating, and other fun family activities. CrippleCreekBUZZ.com � -� an Unofficial Guide to Cripple Creek, Colorado; the "World's Greatest Gold Camp".� GAMBLE, EXPLORE, & LIVE-IT-UP!